. Some users have complained about high power consumption by FD-75A. I don’t think so, normally electronic appliances run by thermostats don’t run at peak power all the time. I have worked out the energy costs and it came about $1.82/month for 10 hrs a week running time. Cleaning Nesco FD-75A is very easy. However, cleaning trays will take a little more effort. Things tend to stick on the mesh design of the drying trays, which makes it slightly difficult to clean up. The fan generates little noise. The instruction manual is slightly short on details, especially on how to dry various things. Overall, Nesco food dehydrator is a nice little product. Apart from the absence of timer, FD-75A is a very good dehydrator. 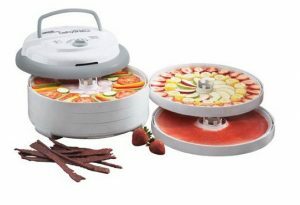 After all it is one of the best sellers among food dehydrators in U.S market. I will always recommend it.